Reduce your reliance on takeout (which almost always comes in single use plastic/disposable containers and is not as healthy as you hope). While practicing law, I commuted for 3+ hours a day so cooking daily was out of the question. When I realized I needed to change my eating habits and focus on my nutrition, I began my meal prepping journey. During a quick Monday morning supermarket shop right before work, I stocked up on snacks and mini meals for the week- Greek yogurt, berries, wraps, spinach, avocado, hummus, etc. I usually ran out at lunch for takeout (in plastic!) and then used the food from my shop to supplement my meals. This was my first version of meal prepping and it worked for me. I cooked over the weekend with Rob (my husband), but relied mostly on packaged, convenience foods during the week. While this was not ideal, having nutrient dense snacks/mini meals available at work was definitely an improvement. Prior to making these changes, I was having bars, snacking all day on calorie dense foods (chips, chocolate, pretzels, etc. ), and eating everything in my house as soon as I arrived home at 9pm. Sound familiar? 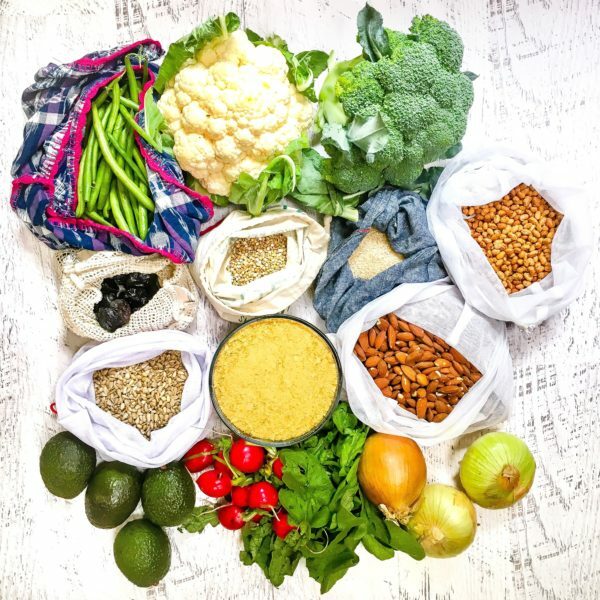 This first version of meal prepping eventually lead me to fall in love with nutrition and before I knew it, I was back in school to become a dietitian. During school, I was forced by circumstance to take my meal prep up a notch. I’d love to say that I was motivated purely by health and saving money, but, in reality, there weren’t any healthy choices close to school and I adopted my low waste lifestyle. Ultra convenience has made it way too easy to forgo meal prep and rely on “fast” food. It was all too tempting to spend Sunday on the couch instead of in the kitchen when I knew that I could get takeout daily for the week. But, as they say, necessity is the mother of invention. At the time, I had no choice but to meal prep because I couldn’t rely on packaged foods or easy takeout as I was avoiding anything in packaging and there were no healthy takeout options. This circumstance provided me with the ultimate motivator to find my flow with meal prepping. I wanted to eat well and save the planet and a little preparation on the weekends enabled and continues to enable me to achieve both. I share this mini history of my meal prepping journey because it was just that, a journey. I didn’t change my habits overnight. Rather, I made incremental changes over years. We all have tipping points, and mine involved adopting my low waste lifestyle. I continue to be amazed at how, even as a health professional, my low waste lifestyle drives my actions more than my desire to be “healthy.” And, while there remain weekends where I’m too busy living to cook, for the most part, I stick to some few basics to ensure my week is healthy and low waste. I’m not a professional chef and my weekly meal preps showcase that! Try not to compare yourself to the gorgeous prepped meals professionals create. They are, after all, professionals! You just want to have delicious, healthy meals for the week. This is why I like to focus on weekly staples instead of full meals. It’s more manageable to meal prep when adopting a routine and having structure. Each week I make nut milk and nut butter, a whole grain (brown rice, quinoa, millet), roasted vegetables (beets, broccoli, carrots, onions, peppers), beans/legumes (lentils, chickpeas) and hard boiled eggs. No matter what else I make (or don’t make), at least I have these to rely on to mix and match for a nutrient dense meal. Combining them with different sauces enables me to use the same staples to create different meals. Then, I usually choose two recipes that excite me that week. Altogether the weekly staples + two larger meals equate to most of the food we need for the week. Plan on Saturday. Prep on Sunday. Leaving my planning, shopping, and prepping to Sunday makes me cry. It’s too much! On Saturday I decide what I’m cooking for the week and shop. And because I hate making too many choices, I let the farmer’s markets choose the vegetables I’m going to roast and meals I’m going to prepare. Because I shop in bulk for most of my items, I get to the grocery store nice and early (more to come on shopping in bulk soon!). Root to frond cooking, or using the entire vegetable when cooking, enables you to get the most out of your produce. For example, I roast squash seeds from butternut squash and delicata squash - this enables me to prepare a meal component (squash) and a snack (seeds) simultaneously. I also use broccoli stalks and beet leaves. This adds bulk to the meals and a variety of nutrients (as different parts of the plants contain different nutrients). Usually the parts of vegetables we throw away are a great source of fiber and considering most Americans do not consume enough fiber, using the whole plant can help you reach your fiber requirements! It’s time to invest in meal prepping essentials, including containers. My ultimate goal is to never have my food touch plastic. This is equally for health and environmental reasons. Portion out your lunches the night before to set yourself up for calm, organized mornings.